Sweden has a reputation for having the world's safest roads and uses the 'Mission Zero' concept in an attempt to end all auto-related deaths. 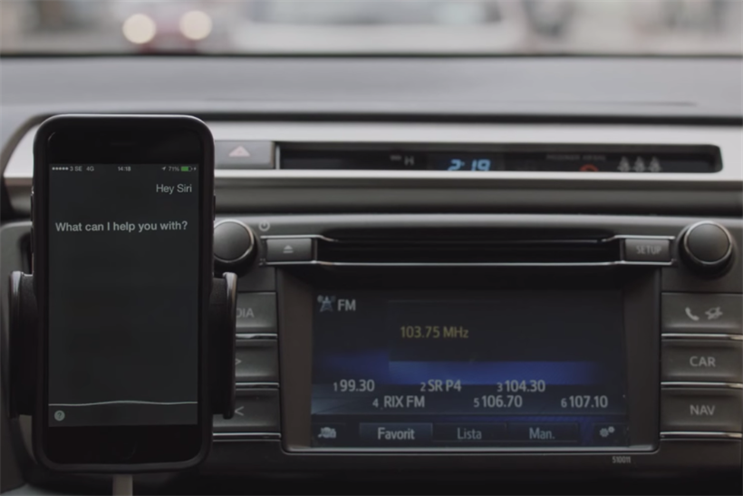 Now Toyota has come up with a radio ad that uses Siri and Google Voice to actually switch off an iPhone or Android phone's text and call functionality, making drivers less likely to pick up calls. The ad relies on the fact that an iPhone, if plugged in and charging, will wake up on the voice command "Hey Siri". Certain Android models will wake up on the "OK Google" command. The ad begins by saying, "Hey, Siri", then proceeds to ask the phone to switch on aeroplane mode, meaning drivers can't call or text while driving. It's thought the ad is a world first in interacting with a device without human intervention. The campaign ran at rush hour, a week before the vacation when Swedes traditionally drive to their holiday homes.